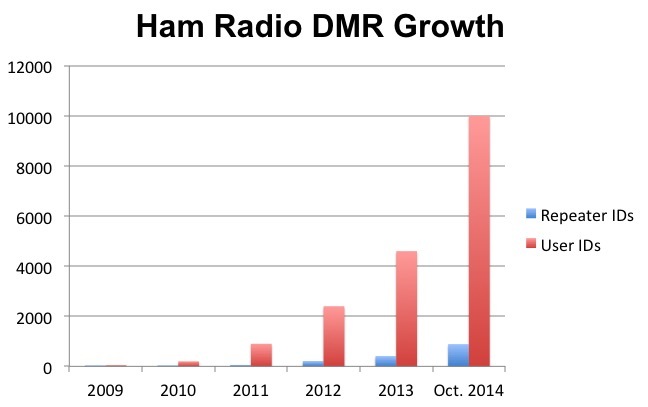 Ham radio DMR welcomed its 10,000 user ID on Oct. 29, 2014. 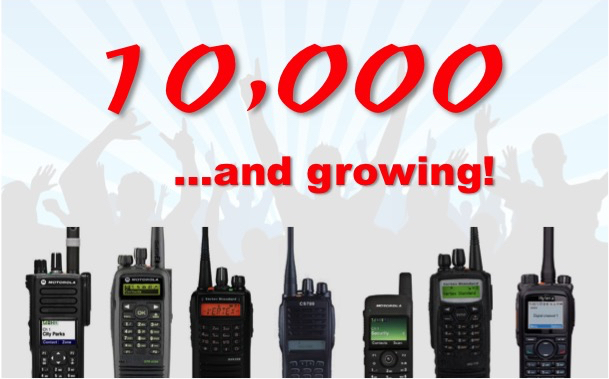 On October 29th, ham radio DMR reached an important milestone by adding its 10,000th user ID, making it one of the fastest growing digital modes within the ham radio community. DMR, which is short for Digital Mobile Radio, is a published standard for digital voice communications by the the European Telecommunications Standards Institute (ETSI), which allows radio equipment manufacturers to build digital radios that are interoperable with one another. By having many manufactures build radios that support DMR, hams can purchase relatively inexpensive digital radios that can communicate with one another, unlike other digital radios that use proprietary formats. For this reason, adoption of DMR has experienced tremendous growth by hams all over the world since its inception. With over 800 ham radio DMR repeaters in 33 countries, 22 of which are represented as part of the DMR-MARC network, hams using DMR radios can talk to each other globally with absolute crystal clarity using the power of the Internet. “I never expected that DMR would grow so quickly within the ham radio community.” said Mike Swiatkowski, AA9VI, one of the lead administrators for the DMR-MARC network – the largest ham DMR repeater network in the world. “Digital voice modes, such as DMR are changing the face of ham radio and helping it to stay relevant with our Internet-based digitally connected society” added Mike. Mike also noted that the first ham DMR repeater was launched in 2009 and the numbers of users has more than doubled every year since then. The lucky ham to receive the 10,000th user ID was Blane Wilson, K3LYE of Jacksonville, FL., an Extra class licensee who has been an avid HF operator since he first got licensed in 1999. “My impression from just hearing the clarity and function of the system and its specific groupings where you can select who you talk to was very impressive, compared to some of the noise and lack of clarity on the traditional UHF/VHF bands.” said Blane, who was introduced to DMR the night before during a presentation at his local ham radio club meeting.